More than 1,000 alumni, students, faculty and staff will gather on Emory's campus Nov. 8 to travel to service projects with a variety of community organizations. Emory Photo/Video. Now celebrating its 12th year, Emory Cares International Service Day will again unite staff, faculty, students, parents, alumni, and friends to give back to their local communities on Nov. 8. 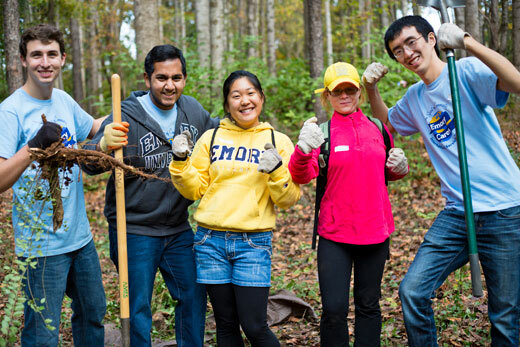 Emory Cares is a partnership between the Emory Alumni Association (EAA) and Volunteer Emory. Approximately 850 students and up to 400 alumni, faculty and staff will gather on Emory's campus this year to travel out to service projects with about 25 community organizations, says Lisa Kendall, associate director with Emory's Office of Student Leadership and Service and staff coordinator for Volunteer Emory. "We will be working in a large capacity and in a variety of spaces to provide everyone who wants to participate with the opportunity to connect with the community justice focus that appeals to them," Kendall says. "From community gardening to working with animals, we have a variety of projects for volunteers to work on." The Volunteer Emory website for Emory Cares offers a full list of organizations and projects open to volunteers Nov. 8, plus a link to register for projects. "We will have a kickoff on Saturday at McDonough Field and we provide transportation to all the different locations," Kendall says. This common goal of service strengthens the bond with others in the Emory community and the university, and increases Emory's visibility around the world, says Venus Miller, EAA program coordinator for Emory Cares. In addition to service projects in Atlanta, the EAA lists projects in more than three dozen other cities, including international projects in Hong Kong, London, Madrid, Seoul and Singapore. "On Nov. 8, Emory Cares and Emory Cares Everywhere projects will continue to connect with more organizations in need," Miller says. "Around the world, any Emory alumnus can sign up to take part by visiting the EAA Emory Cares website to register for a project that inspires you." Since its inception, Emory Cares has worked in collaboration with Volunteer Emory to serve 118 organizations in 32 cities and six countries around the world. With more than 10,000 volunteers having already lent their hearts and time to worthy projects, Miller says, "Emory Cares International Service Day will continue to represent the best of Emory's commitment to bettering our communities." This year, Emory Alumni Board president Doug Shipman 95C, CEO of the Center for Civil and Human Rights in Atlanta, will give the keynote speech at Emory Cares before participants depart McDonough Field to fan out to their service project sites. "We are trying to connect Emory to the community, to really understand the needs of community and provide the opportunity for our students to be contributing community members, not only in the Emory community, but the Atlanta community, and to promote furthering those relationships in the future," Kendall says. Established in 2003 through the work of Renelda Mack 83C, former president of the Emory Alumni Board, Emory Cares International Service Day has become one of Emory's favorite traditions and flagship programs. Emory Cares was recognized with the 2008 Presidential Award for General Community Service — the highest award of its kind a university can receive.